Acceptance into the Leadership Rockland program is through a competitive application and interview. This page will provide answers to many questions you may have about the program and the admission process. Do I need someone to nominate me for the program? You do not need someone to nominate you for the program. If you want to be part of the next class, just submit the application! You will need some reference letters as described below, but no one has to “submit” your name in order for you to apply. What is the tuition for the program? 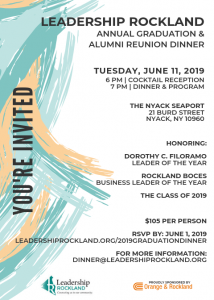 The tuition for the Leadership Rockland program is $1,200. Each applicant must submit a $25 non-refundable deposit toward tuition. Accepted participants are notified in July prior to the start of the program year and the applicant (or his/her employer) must pay full tuition by September 1 of the program year. Partial scholarships may be available for qualified applicants based on need. If you and your employer (if applicable) are willing to make a commitment for you to attend each of the 11 sessions from September through June, and you and your employer understand the tuition requirements, please so indicate with your signatures on the application signature page. Yes. If you submit your complete application package (including the signature page, rèsumè, and recommendation letters) by March 1st, your program tuition will be $1,100. If you submit your complete application package by March 15th, your tuition will be $1,150. After March 15th, there will be no tuition discounts available. When does the application period begin? Applications are accepted on a rolling basis. Applications received after the deadline for the current year will be considered for the following year’s class. When is the deadline for submitting an application? The application deadline is April 1st for the following September’s class. Any applications received after the deadline will be considered for the following class year. The application must be completed online. If you encounter any problems please contact our webmaster at info@leadershiprockland.org. Once you have submitted the application, you will receive a confirmation email, which will remind you that other materials may need to be forwarded to us before your application will be deemed complete. What other items need to be submitted? $25 nonrefundable deposit – paid online or mailed to the address below. A current résumé – uploaded with the online application or emailed to the address below. Application signature page – uploaded with the online application or emailed to the address below. (2) Personal Recommendation Forms – submitted via the online form. If any materials need to be emailed or mailed to us, you can email materials to admin@leadershiprockland.org. You may mail materials to us, but online submission or email is the preferred means of sending us the documents. Are there any special requirements I should be aware of? Applicants must submit at least two (2) personal recommendations that are done via the standardized online form. Ideally, each reference/recommendation source should be from a separate source (different organizations). ***Important Note: It is your responsibility to make sure the persons submitting a recommendation form on your behalf does so prior to the application deadline. We will notify you when we receive the recommendation forms submitted on your behalf. Make sure to plan ahead so that you are not trying to get this done at the last minute. Pay particular attention to the requirement that the letters must come from different sources and organizations. Applications are forwarded to the selection committee. Once the applications have been reviewed by the committee an interview will be scheduled. You will be contacted by your interviewer to schedule the date, time and location of the interview. When will I be notified as to whether or not I was accepted into the program? After the interviews are completed, the selection committee convenes to discuss the applicants, and make a recommendation to the board of directors for the next year’s class. This entire process usually lasts until the middle of June. After the board approves the class, the administrator will make contact with each applicant to inform them of their status. If I am not accepted into the program, can I reapply? We strongly encourage applicants who don’t get into the program on their first try to reapply. One of the criteria that the board and the selection committee look for is a diverse class that represents the entire county. A candidate may be a very qualified individual, but there may be others in the class with similar characteristics that would create an imbalance for that particular class year. Many a successful graduate had to reapply to gain admission into the program. Is attendance and class participation important? These items are so important to the overall value of the program that the Board of Directors has spent significant time formulating attendance and conduct policies for the class. We realize each person in our program is an adult, most with very busy lifestyles, and that you are giving up your valuable time to attend this program. We respect that commitment, and in return we provide what we believe is a learning opportunity unlike any other you will have the good fortune to attend. We also value the time and effort our coordinators put in, all on a volunteer basis. Attendance is mandatory. You must attend each session, and must be present for the entire session to its conclusion. These are long days, and most sessions run right up to the last minute, because there is such depth of material to cover. Participation by the class members is a critical component of each and every class. Each prospective candidate is provided a list with the class schedule prior to being offered acceptance into the program, so you can assess ahead of time if you anticipate problems with attendance. Class time is Leadership Rockland time. Please limit your cell phone usage to authorized breaks. Turn cell phones off or silence them during class periods. Arrange your business or personal life around your class schedule. Do not plan on running errands or catching up on business while you are in class. You can not skip out for an hour or two. This would be an unexcused absence and could result in termination from the program. Of course, issues do arise on any given day. Direct all inquiries to the program administrator as soon as you become aware of the problem. Accommodations, where necessary and possible, will likely be made.